It's graduation day at Huntington Hills High, and the seniors hold the ultimate teen party where class nerds become class studs, super-jocks are humiliated and freshmen crushes blossom into grown-up romance. $8.025 million on 1987 screens. Rated PG-13 for teen drinking and sexuality, and for language. 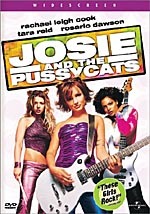 After I reviewed the abysmal Josie and the Pussycats back in 2001, I read other folks’ reviews and learned some details about the DVD for Can’t Hardly Wait, another flick from Josie’s directors. Though my dislike for Josie should have dissuaded me from any interest in their other work, one element of the DVD intrigued me. I heard it had a terrific audio commentary. Since I’m a huge fan of those tracks, I decided that I needed to give Wait a look. The biggest downside of this choice stemmed from the fact that I needed to actually watch Wait before I could enjoy the commentary. Based on my experience with Josie, this prospect didn’t delight me. However, while Wait failed to thrill me, I found it to offer a reasonably witty and entertaining teen comedy that kept me moderately interested. Wait focuses on the evening after graduation for some high school students. All of the action revolves around one big party that follows this event. The film boasts a huge roster of participants, but some main characters evolve. Most touted are Mike (Peter Facinelli) and Amanda (Jennifer Love Hewitt), the allegedly perfect couple who broke up on graduation day after four years together. An arrogant jock who dreams of grander pastures with college women, Mike dumped Amanda so he could play the field. This humiliates her to a degree, but matters eventually backfire when Mike discovers that single life isn’t as hot as he imagined. While this matter upsets Amanda, it elates Preston (Ethan Embry), the slightly-dorky dude who has dreamed of her ever since she came to their school in ninth grade. After four long years, he finally sees his chance, and he pours his heart into a much-refined letter meant to attract her. Unfortunately, he’s a bit of a wimp, and he dilly-dallies through much of the film until he can finally muster the courage to deal with her. Preston’s cynical friend Denise (Lauren Ambrose) has issues of her own. She confronts these with Kenny (Seth Green), one of the school’s wannabe black kids; Kenny’s as white as they come, but he feigns street attitude and garb, all of which make him feel like the baddest of the bad. Unfortunately for him, none of the girls at the party agree, and his oft-stated desire to get laid goes nowhere. However, in an attempt to get back at her cheating boyfriend, one tipsy female says she’ll do him. Kenny needs to purge his bladder first, however, an enterprise that ends poorly when Denise accidentally locks the two of them in the bathroom. There they discuss their estranged relationships; they’d been close in younger days but he ditched her to seem cool once they hit middle school. Rounding out our main roster is William (Charlie Korsmo), a serious nerd who wants to get revenge on Mike for all the nasty things he did to him over the years. With his dorky friends, William conjures a plan to humiliate Mike, but he gets badly sidetracked along the way. He downs a few beers to fit in, but this loosens him up and makes him behave in unusual ways, all with interesting results. Although Can’t Hardly Wait tries to include some “coming of age” aspects, its heart isn’t in this form of introspection. Instead, the film works best as a giddy romp through a rowdy party. The movie flits rapidly from character to character, and the camera rarely remains still. Instead, it prefers a “fly on the wall” attitude that combines a number of storylines within one spastic package. For filmmakers like directors Harry Elfont and Deborah Kaplan, this is the best way to go. As demonstrated during Josie, their talents don’t suit movies that try to have any particular message or point, so Wait works most effectively when it simply provides a gleeful skewering of high school cliques and stereotypes. Because of that, the flick’s first half seems most compelling; the second segment tries to get deeper, but these attempts generally fall flat. Granted, they were expected for this sort of film, but they still didn’t come across particularly well. At times, it appeared like they wanted to make an updated version of American Graffiti, but such aspirations are beyond the directors’ reach. However, that doesn’t mean that they can’t make a fairly fun and entertaining little romp. Wait succeeds best when it flits about rapidly. Once the movie sticks with any single subject for too long, it becomes somewhat tiresome and bland. The chaos of the situation is its strongest aspect, and the film seems most entertaining when it takes advantage of that. Ultimately, not much about Can’t Hardly Wait sets it strongly above its teen brethren, but I must admit that it definitely is a better flick than most in the genre. It suffers from some of the usual pitfalls, and it can be slow-paced and dull at times, but the moderate satire found in its portrayals allows it to become fun and witty at times. In the end, Can’t Hardly Wait was a forgettable but enjoyable little flick. Can’t Hardly Wait appears in an aspect ratio of approximately 1.85:1 on this single-sided, double-layered DVD. The image has been enhanced for 16X9 televisions. This was a consistently mediocre transfer. Sharpness was decent. Some moderately soft shots materialized, but most of the flick demonstrated reasonable definition. No signs of jagged edges or shimmering occurred, and edge enhancement remained minor. No source flaws marred the presentation, but grain seemed awfully heavy. That was a consistent distraction throughout the movie. Colors looked mediocre, partially due to the grain. That factor made the hues look less vivacious than they should. The flick went with a natural palette, and the tones were acceptable, though they came across as a bit dim due to that grain. Blacks were fine, though a little inky. Shadows tended to seem somewhat dense, as low-light shots appeared a bit thick. This was a watchable flick at best and never appeared particularly positive. As for the Dolby Digital 5.1 soundtrack of Can’t Hardly Wait, it moderately surprised me. The soundfield provided a fairly immersive affair that used all five channels to reasonable effect. Music accompanied most of the movie, and the songs blasted cleanly from the speakers. The tunes showed good differentiation among the channels and they added a nice element to the mix. Effects and dialogue also showed up in the side and rear speakers, and they became a good complement to the action. A fair amount of speech emanated from the individual channels, an aspect of the mix that cropped up neatly during the film’s opening sequence; as unpictured teens set up the movie’s actions, their voices came from all around us. Effects also used the different speakers well, as these elements created a solidly realistic and convincing environment that blended together well. Audio quality also seemed to be fairly good. Some speech displayed modest edginess, but most of the dialogue sounded acceptably warm and natural, and I detected no problems related to intelligibility. Effects were distinct and accurate, and they showed no signs of distortion or other concerns. The many tunes played in the movie also fared well. They displayed good dynamic range, with clean highs and reasonably low and rich bass. Ultimately, Can’t Hardly Wait provided a solid auditory experience that worked nicely for the film. How did the picture and audio of this “10 Year Reunion Edition” compare to those of the original 1998 DVD? Both DVDs offered identical audio, but the visuals looked different. The new disc lacked the minor array of specks and nicks found on the old one, but it also was softer, grainier and less dynamic. The differences weren’t radical, but I thought the original disc provided superior visuals. The “10 Year Reunion Edition” includes most of the supplements from the 1998 disc along with some new ones. I’ll mark new extras with an asterisk. If you fail to see a star, then that component already appeared on the original release. We start with two audio commentaries. First we find the original chat from the 1998 DVD. It includes directors Harry Elfont and Deborah Kaplan plus actor Seth Green and producers Jenno Topping and Betty Thomas. All were recorded together for this running, screen-specific affair. Note that Thomas doesn’t enter until about 55 minutes into the commentary. Based on what I read elsewhere, it was Green’s contribution that promised to offer the most fun. At the start of the track, he speaks with a British accent for no apparent reason. This provokes a couple of remarks from the others and he stops after a fairly brief interval. This aspect of the commentary disappointed me because I hoped Green would carry his gag to a greater extreme. The sheer weirdness inherent in his decision delighted me, and based on what I read elsewhere, I thought he’d continue to annoy the others to a much greater degree. As it stood, the accent wasn’t much of an issue, and it took little for him to cease. I was seriously disappointed when he quit. Despite that letdown, I really enjoyed this track. The commentary for Wait was easily one of the whiniest I’ve ever heard, but I mean that as a compliment. The vast majority of these recordings offer far too much happy talk and praise. To be certain, I heard a little about how talented some of the participants were, but for the most part, this was a gleefully crotchety track. Throughout the piece, the speakers told us what they did wrong and pointed out errors. They also discussed all of the changes they had to make to get their “PG-13” rating, and they clearly wished that these hadn’t occurred. They rag on each other to a degree, and they spill dirt about absent collaborators. All of this was wrapped in a lively, coherent package that rarely ceased to be entertaining and irreverent. We also get a new “10 Years Later” commentary with *Elfont, Kaplan, Green, and actors Donald Faison, Peter Facinelli and Joel Michaely. All sit together for another running, screen-specific chat. They discuss cast and performances, updates on various participants, music, characters, and various related thoughts. Add in a healthy dollop of margaritas and we get another rollicking commentary. Maybe a little too rollicking at times, as the participants tend to talk on top of each other. Still, there’s a lot of energy on display, and the alcohol makes things playful and lively. Though not as informative as the original track, we get a reasonable amount of material about the flick and just have fun during this enjoyable piece. For a subtitle commentary, we head to *Special K’s 411 Track Yo’. Throughout the film, it tosses out various facts about pop culture references, cast and filmmakers, and production topics. We also get occasional snarky comments about the movie’s era. Some interesting tidbits occasionally emerge, though not a ton. Maintain modest expectations and you might enjoy it. Three programs appear under “Featurettes”. *Huntington Hills Class of ’98 Reunion runs 26 minutes, 41 seconds as it presents notes from Michaely, Kaplan, Elfont, Facinelli, Green, Faison, casting director Mary Vernieu, and actors Freddie Rodriguez, Jay Paulson, Ethan Embry, Nicole Bilderback, Victor Togunde, Jenna Elfman, Jennifer Lyons, Michelle Brookhurst, and Tamala Jones. The show looks at cast, characters and performances. Just like the commentaries, “Reunion” provides a rollicking look at the flick. How often do you find featurettes that include extended observations on the lead actress’s breasts and jokes about giving performers herpes? It’s too bad that some prominent actors like Jennifer Love Hewitt and Lauren Ambrose fail to appear, but the program entertains and informs nonetheless. *Can’t Hardly Wait: The Making of a Teen Classic goes for 14 minutes, 27 seconds and includes comments from Kaplan, Elfont, Jones, Embry, Togunde, Bilderback, Green, Faison, Lyons, Rodriguez, Facinelli, Michaely, Paulson, Brookhurst, and Elfman. We learn about the origins of the project and the development of the script and story, more performance notes and the atmosphere on the set, and various anecdotes from the shoot. “Making” fails to live up to its title, as it doesn’t give us a real “making of” program. Nonetheless, it throws out many more interesting facts and becomes another enjoyable show. Finally, *The Life of the Party lasts nine minutes, 28 seconds and features Rodriguez, Bilderback, Elfman, Green, Faison, Michaely, Embry, Lyons, Paulson, Jones, Kaplan, Elfont, Togunde, Brookhurst, and Facinelli. The participants discuss their own high school graduation party experiences and their current perspectives on parties. It’s the least consequential of the pieces, but it’s entertaining enough. Six *Deleted Scenes fill a total of seven minutes, 16 seconds. These include “’Pop Tarts?’” (0:24), “Extended Dendrophillia” (0:48), “Alternate Trip McNeely” (2:37), “Alternate Jail Scene” (1:37), “Extended Party Bust” (0:46) and “This Party Sucked” (1:02). Since the original commentary alluded to cut footage but the old disc included none, I looked forward to these. Unfortunately, they’re all pretty dull. The two alternate bits aren’t very different, and the extendeds add little, though “Bust” does let us see more of drunk, crying girl. “Sucked” and “Tarts” are pretty forgettable as well, so don’t expect much from these unused seqyences. A few other small elements round out the package. We find a surprisingly interesting music video for Smash Mouth’s “Can’t Get Enough Of You, Baby”. The clip uses the standard format; we find a mix of lip-synched performance footage from the band and snippets from the movie. However, the “live” segments show a bright and fun Sixties look, and they seem entertaining and vivid. In addition, the video includes a cameo from Jennifer Love Hewitt, who looks especially hot. Lastly, we get a trivia game called *You Know You’re ‘90s If…. In this contest, we get a slew of multiple choice questions intended to figure out if you know your ‘90s from other decades. Some are easy, while some are tougher. It’s a surprisingly fun game. Some ads open the DVD. We get promos for So I Married an Axe Murderer, Married Life, Kabluey, Center Stage: Turn It Up and You Don’t Mess With the Zohan. These also appear in the *Previews area. Does this release lose anything from its 1998 predecessor? Yup – a few tidbits fail to reappear. This disc drops the film’s trailer and a dull stills gallery. I don’t miss the latter, but it’s too bad the new set omits the trailer. Can’t Hardly Wait isn’t a classic, but it offered a reasonably bright and amusing teen flick. Members of that age group will clearly like it best, but old folks like me can still derive some enjoyment from it. The DVD provided mediocre picture, good audio, and some fun extras. It’s not a great DVD or a terrific movie, but the package works well as a whole. If you want to own Wait on DVD, matters become somewhat complicated. Both this 2008 SE and the original 1998 disc offer identical audio, but the new release has significant improvements in terms of extras. Unfortunately, it takes a hit in the picture quality department. Neither release looks great, but I think the old one provides the more satisfying visuals. The images are similar enough for me to recommend the SE to fans in search of Wait, but I don’t think it merits a “double dip” for the folks with the original version.